The Feast of the Santo Nino is just around the corner. Five years ago, there was a popular teleserye on GMA-7, a major TV network that was aired on its prime time block. Upon seeing the teaser plug, I felt a surge of excitement. From the first time I saw its teaser got aired, I knew it will be worth watching. And it was, indeed! In fact, when it finally debuted on national TV, its pilot episode garnered a rating of 21.2%! ABG Nielsen Philippines’ Mega Manila household TV ratings reported that the series had its highest rating on September 8, 2014 with 30.4 % while its last episode got a 29.6 % rating. The series was released from May 26 to September 12, 2014 with a total of 80 episodes with a running time of 27-38 minutes each. ‘Niño’ was a recommended daily dose of good entertainment on GMA Telebabad on weekdays after 24 Oras. You may ask, what made NINO truly worth watching? From the veteran actors to the fresh new faces of Niño, no one can deny the combined acting prowess of the cast members. Whether they are making us laugh or making us bawl our eyes out, Niño’s stellar cast give their best every night. Along with the winning formula of magical realism—the network introduces Miguel Tanfelix as the next big star, playing the title role. Truly he has captured our hearts with his effective portrayal of Niño, a mentally challenged 15 year old teenager with a positive attitude and a good heart who became a shining example of hope and inspiration to his town mates in Barangay Bagong Pag-Asa and prove that miracles exist with the help of his “Tukayo”, a Sto. Niño incarnate played by child star David Remo. GMA Network was able to present a stellar cast of the country’s most respected artists in film and television: Ms. Gloria Romero as Lola V, Niño’s carefree grandmother; Dante Rivero as Don Pedro, Hannah’s father; Angelu de Leon as Leny, Niño’s adoptive mother; Jay Manalo as Lucio, Don Pedro’s adopted son and protege; Katrina Halili as Hannah, Jonathan’s wife and Niño’s kind-hearted mother; Neil Ryan Sese as David, Niño’s adoptive father; Luz Valdez as Tiya Epang, David’s aunt and Lola V’s best friend; Ces Quesada as Mrs. Santos, Tiny’s mother; and German Moreno as Kapitan Pete, the Barangay Captain of Barrio Pag-asa. Jerald Napoles as Obet, David’s friend; Angeli Bayani as Belen, Leny’s close friend; Flora Gasser as Yaya Ason, Hannah’s loyal nanny; Rafa Siguion-Reyna as Ric, Lucio’s friend and right-hand man; Annika Camaya as Charito, Obet’s partner; Stephanie Sol as Olivia, Lucio’s girlfriend completed the line-up. Playing an equally important role in Niño is the Kapuso Network’s leading man Tom Rodriguez as Gabriel, Niño’s hardworking father, who makes a special guest appearance in the TV series. It was under the capable hands of the late veteran and award-winning director for both film and television—Maryo J. Delos Reyes whose goal is to wake up the Filipino televiewers’ sensibilities, stream of consciousness and hope via GMA-7’s drama series titled—NIÑO. Given Direk Maryo J’s undisputed track record of drawing his spectators with his kind of touch in such genre and based from his successful and FAMAS award-winning drama film Magnifico in 2003; he exceeded the expectations of repeating his winning streak in this primetime show. A dose of good vibes in every episode! With Niño, every night is a happy night. Niño is the family drama that doesn’t just make you let out tears of heartache but also tears of joy. The scenes we see each night on Niño are scenes that all people can relate to. This family-oriented drama series features the heartwarming story of a boy who will inspire other people to remain hopeful in the midst of life’s challenges. Niño, as a character and show, will not only promote good family values but will also encourage viewers most especially the kids to become loving and optimistic at all times. In the series, viewers saw how Niño was raised by his adoptive parents Leny and David after being separated from his biological parents Hannah and Gabriel because of an ambush, became a source of inspiration and hope to his town mates. Niño’s Tukayo will help and guide him in overcoming the different difficulties and problems in Barangay Bagong Pag-asa with courage and confidence. They are partners in encouraging the people to cope with life’s challenges with a child-like faith, appreciate life by becoming loving and hopeful always. Though the concept may not be totally fresh, the network has brilliantly combined two successful inspirational-themed series—‘ May Bukas Pa’ (which ran for a year from 2009 to 2010) and ‘Budoy’ (which only lasted for five months—from October 2011 till March 2012). Both shows are from its rival network. Apart from such move—putting together the biggest and talented artists in this show is just right to back up the launching of Tanfelix’s career at that time. Niño, which is made by the GMA Entertainment TV Group, is another first in the television industry for its original concept and educational plot. Under the helm of award-winning director Maryo J. delos Reyes with Conrado Peru as second unit director, Niño was a certified hit among Kapuso viewers and their families, most especially the young ones. Niño was the new hero of his generation. Niño Inocente is a fun-loving teenager who is close to his family and friends and was brought up by his adoptive parents, David and Leny Inocente, to be righteous and obedient. Niño, a mentally-challenged teenager, learns how to overcome obstacles along with his best friends, Gracie and Tukayo, and continues to inspire his community with his good examples. The prominent Sagrado family of Barangay Pag-asa is close with Niño, especially Hannah, unknowingly to her is Niño’s biological mother. Hannah hopes to be reunited with her long-lost son one day, who was separated from her. There are still many evil forces in Barangay Pag-asa, such as the Santoses and Lucio, the Sagrado’s loyal but scheming assistant. Niño and his father, Gabriel were separated from Hannah during an ambush caused by Lucio. The whole community gradually learns from their mistakes to become better, kind-hearted people and to stay strong in their faith. Niño has become the ultimate role model of the youth. He was undisputedly the most lovable character on local TV. He makes us want to dream, to be hopeful, to be kind, and to love more. Nino inspired many people to do and be good! Niño definitely appealed to the family as it introduced the “Naynay Commandments”, a set of values and good manners that will teach the importance of being responsible and honest individuals and how these commandments can be applied in everyday life. These “Naynay Commandments” inspired parents to raise their children to be hopeful and loving like Niño. I believe the teleserye’s ‘Nay Nay Commandments’ will surely inspire the children to learn good moral values and help them mold their character and attitude as well. “Ang Sabi ni Lola V” at “Ang Mga Payo Ni Tukayo” were segments the viewers awaited. Every episode of Niño is filled with moral lessons not just for the youth but for everyone. It brings out the good in us. If Niño can be a good person, so can you. Being cool is not the new cool. It’s being good! I would like to share with you a short comment I made on the top-rating show which was published in the Philippine Daily Inquirer Entertainment’s Saturday Special last June 7, 2014 through the Fans’ Day column of Andy Bais. 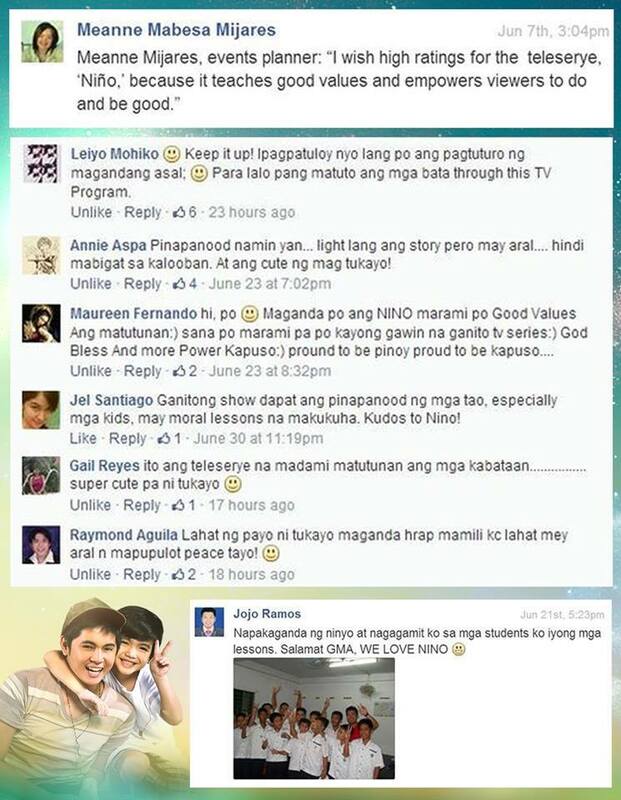 One memory my heart will always treasure is that from July 22-29, 2014, the comment was featured in the show’s TV plug and airs over GMA 7. By God’s grace, it crossed over from print to TV! Niño has inspired viewers from its inception and continues to do so every day up to its final episode. The show received many messages praising the program and the lesson it aims to impart to the people. Viewers are grateful for the inspiration that Niño conveys to them. Aside from its tested formula, it is very timely. People need inspiration and to have ‘hope’ in these tough, trying times. This series has all the elements that the viewers, particularly what the masses are looking for. With all the intrigues, the controversial issues happening in Philippine society; maybe Niño was the answer to divert and route all ‘negativity’ and turn it into something ‘positive’ instead. This show may just also awake the youth of today that technology like online gaming aren’t the solution to escape the painful realities of life, rather strengthening one’s faith in Our Lord Jesus Christ. I totally agree with Direk Maryo J, this show offers something that uplifts our weary spirits. It inspires people who have entirely lost hope and rekindle it. What’s also important—the show instills good values and timeless life lessons. Truly, GMA Network presented another original primetime treat that surely made a mark in the hearts of Kapuso viewers via the drama series Niño. It was great to reminisce about the outstanding performances of the cast, feel the good vibes, witness small acts of heroism, getting the urge to do good deeds every day, and be inspired. Do all of these long after the TV series is over.